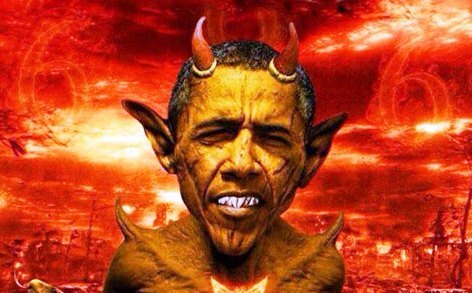 PJ Media reports that news outlets in Egypt are showing photos depicting Barack Obama as Satan. The Al Wafd articles reports that the image is making the rounds on Facebook, and describes the photo, although it incorrectly identifies the pentagram as the Star of David. Stupid Arabs. They should be careful. With the stable of lawyers Satan has with him in hell, they are in danger of being sued for defamation. True. Beelzebub may be malevolent - but he is competent. The evil he sows is intentional and does not pretend to be "for the greater good". He might also sue them for inflammation. @Damncat, isn't Obama doing what he's doing intentionally? I don't think he's really pretending anymore; his supporters and other willfully blind still are. Yes, I agree - much of the dame Obama does is entirely intentional. But I think a lot of it merely a byproduct of his stunning incompetence. This is another reason Obama thinks so highly of himself - he can destroy America without even trying. Thank you for not putting the chapter number. barry only wishes he looked that cool, instead of a limp wrist fairy homosexual. barry is way too incompetent to be evil. He is a pimp. axlerod and soros, they are truly evil and behind the boy blunder. Actually barry wishes he were competent enough to be incompetent. After all he went o haavard. Competence and ivy league do not mix. Fairly descent likeness. They've got the ears down. The book of Jude is only 1 chapter long, so only the verse numbers are necessary.